Not your usual museum curator: Dr. Tobias Capwell is on the leading edge of bringing historically accurate martial arts (jousting and sword combat) back into the public eye. The term “museum curator” might give you an image of someone who fits the stereotype of an academic – quiet, retiring, and bookish. But in the world of medieval studies, there are plenty of interpreters, docents, and curators at castles and armor collections that break that mold quite handily – and right at the top of that list is Dr. Tobias Capwell. By day, Dr. Capwell is the curator of arms and armor at London’s Wallace Collection, an art museum that has, since it was established in 1897, housed one of the finest displays of medieval and Renaissance armor in England (with more than 2500 pieces in its vaults) as well as plenty of other outstanding paintings, sculptures, and other pieces of art. 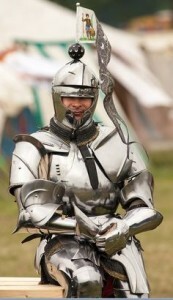 Recently, Dr. Capwell has been involved in a very high-profile project: The excavation of the remains of King Richard III (which were unearthed just last year) and the efforts to reproduce a set of armor that would have functioned properly for the malformed medieval king, based on his detailed understanding 15th century fashion in both clothing and armor. Dr. Capwell’s expertise on this topic has been recently brought to the public eye in a television documentary “Resurrecting Richard III,” which airs on PBS this month as part of the “Secrets of the Dead” series. Dr. Capwell will also be in San Diego in October for the annual Tournament of the Phoenix jousting competition, and Chivalry Today has been honored to help coordinate a series of lectures throughout Southern California while he’s here – one of which, presented through San Diego’s Oasis Learning Center, will give a “behind the scenes” look at the process of crafting an accurate replica of King Richard’s armor through Dr. Capwell’s extensive study of the uniquely English style of knightly habiliments. Dr. Capwell joins Scott Farrell for a conversation about fashions of English armor, the life and death of King Richard III, and what we can learn from both of these things about knights – and chivalry – in medieval England. Watch Resurrecting Richard III, an episode of the PBS series “Secrets of the Dead,” featuring Dr. Tobias Capwell on-line at the PBS Video website. Also: Watch Dr. Tobias Capwell’s lecture on the remains of Richard III and his armor for the Richard III Society at the University of Leicester, shortly after the discovery of King Richard’s remains. What, exactly, do we know about Richard III? Much of our modern perception of King Richard – an acclaimed warrior, and the last English king to die on the battlefield – has been shaped by Shakespeare, as a deformed, malicious, gleeful villain. This performance by Sir Laurence Olivier has, for decades, been the defining image of Richard III.